As described on the main page, Version 1 of this project was a failure due to my choosing a crummy controller. I finally decided to reboot the project with a pretty substantial redesign using open-source projects. Distributed sensing using the Arduino ($30) and Teensy ($20) controllers connected via RS485. Additionally, I wanted to add some monitoring of the Outdoor wood boiler that we installed between V1 and V2 of this project. 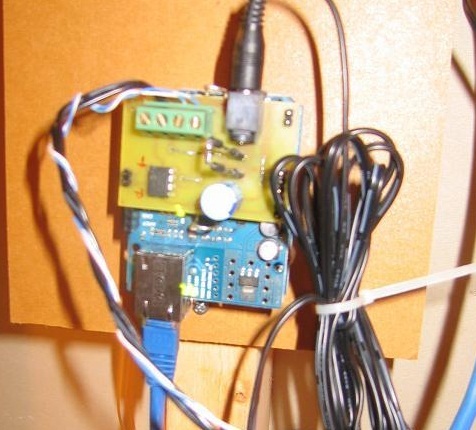 Simple devices based on Teensy controllers (running as Teensyduinos) monitor the heatpump relays and various system temperatures, then send measurements to the main controller (an Arduino Uno) via RS485. The Uno acts as an RS485-to-Ethernet converter (via an Arduino Ethernet shield), forwarding the data (via an HTTP POST) to the webserver. The webserver stores the data and formats it when a browser loads a webpage. While it may initially seem more complex to have multiple devices connected via RS485, it's actually simpler to construct and debug because each controller (Teensy and Uno) runs a simpler program. Additionally, storing the data on a webserver is easier than storing it in an embedded device, and rendering the display in HTML is more flexible than doing it in a Windows app. There are two of these devices, one mounted on each relay unit. The PC board and program are identical for both. 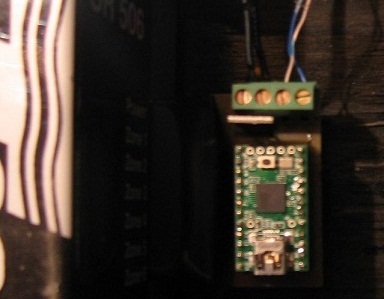 The Teensy's A/D converters monitor the IR Xstr outputs to detect when a particular LED is on or off. The blue/white wires are the RS485 pair; the black wires are 12v power which is regulated on board to 5v. These devices were actually the hardest part of the whole system to get working correctly. The hardware was pretty straightforward, but I went thru over 20 revisions of the firmware before I got it right. The most challenging part is that it was surprisingly hard to accurately monitor the LEDs. At first I ran the processor inputs as digital, but they were continuously flipping on and off. So I changed to analog mode, which reads the sensors' voltage on a scale of 0 to 1024 (0v to 5v). But even then I found that, wehn the LED was on, the A/D readings would fluctuate, almost as of the LED's intensity were varying. This was the cause of the digitl inputs' craziness, but was hard to interpret in analog mode. I finally evolved into an algorithm that provides hysteresis and that solved it. At the bottom is the Uno, which manages everything (the Uno is hidden by the Ethernet shield). On top is my custom RS485 and power board. 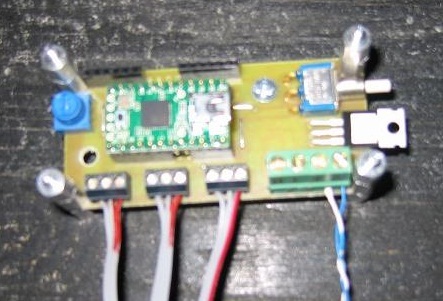 This converts the differential RS485 signal to TTL which is fed serially to the Uno. This received data is parsed by a PHP script which stores the data in a MySQL database for retrieval when the data-display page loads. OWB: The temperature of the water coming in from the outdoor wood boiler. This typically ranges from 170 to 190 degrees F. If it falls below 170° that means that the boiler is out of fuel. OIL: The temperature of the water leaving the oil boiler. This will fall as the house draws heat and causes the heat pumps to turn on. 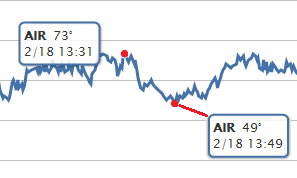 AIR: The outdoor air temperature. This is an indicator of how much heat the OWB will need to generate. 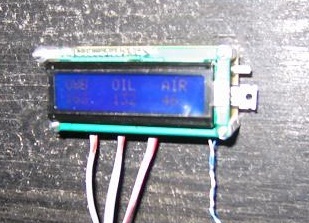 I got the LCD for $10 at adafruit.com. As a bonus, Adafruit has a step-by-step tutorial for using the LCD with an Arduino! 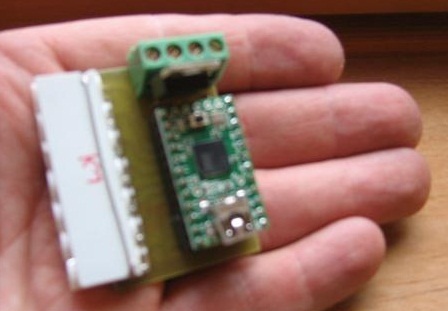 The board is about 1.5" tall and 3.5" wide, the exact same footprint as the LCD. The temperature sensors are TMP36 parts in a that I also bought for $2 each from Adafruit. I soldered the TMP36 leads to ribbon wire and shrinkwrapped the connections. As usual, Adafruit has a tutorial for using the TMP36 with an Arduino. 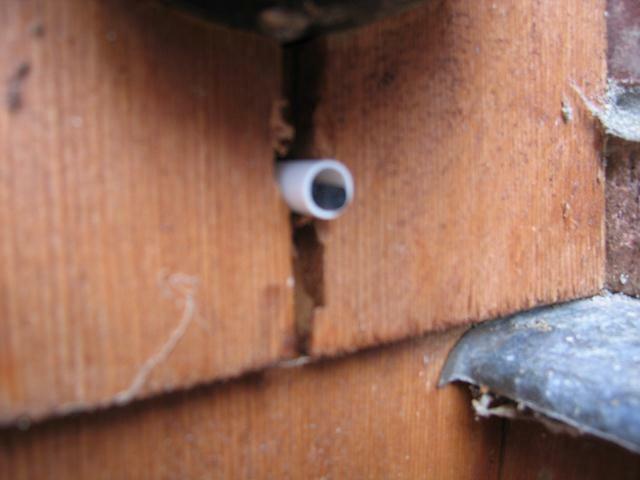 I lined the hole with a small PVC tube in order to make it easy to thread the wire and sensor thru the drill hole. 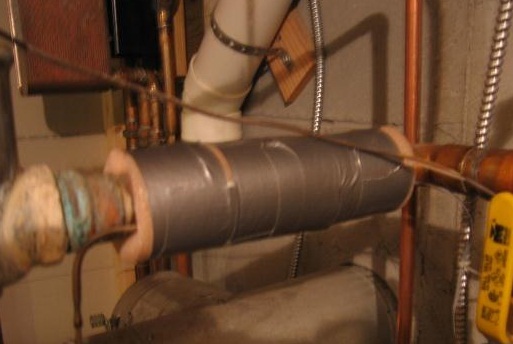 Here you can see the wire and sensor sticking out of the tube. The green thing above it is the fresh air intake for the oil furnace. Ever since I first saw the temperatures on the LCD (which was long before I could see them online), I've been bothered by the fact that my OWB temp was much lower than the temperature displayed on the wood boiler itself, and by the 20° differential between the OWB and OPL temps. Whay was I seeing such big dropoffs? Were my sensors and/or my firmware reliable? Was I really losing 15° of heat between the OWB and the house? Was the heat exchanger really so inefficient that I was losing 20° of heat between the OWB and the OIL? 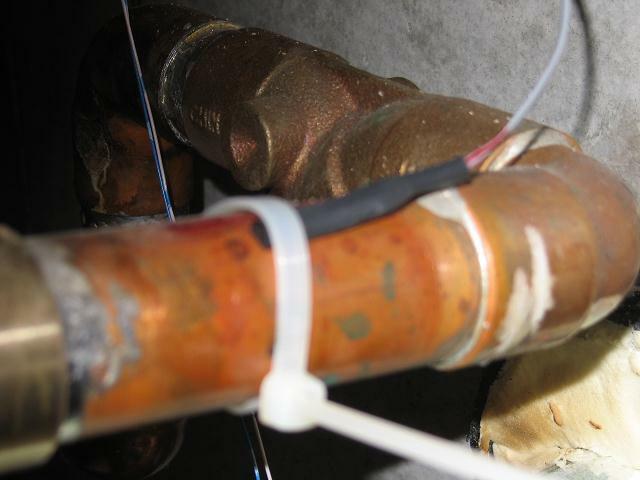 I guessed the cause might be that while the OWB and OIL sensors were tightly strapped to the pipe, there was some heat loss due to the backs of the sensor being exposed to air. I instantly saw a jump in both temps. 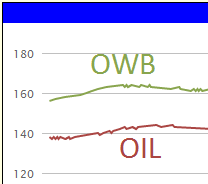 OWB increased 15° (now only 5° less than the boiler's display) and the OIL jumped 20° (now only 8° less than OWB, a much more plausible value). The next thing I need to solve is the volatility of my AIR sensor. This is due to the sun. 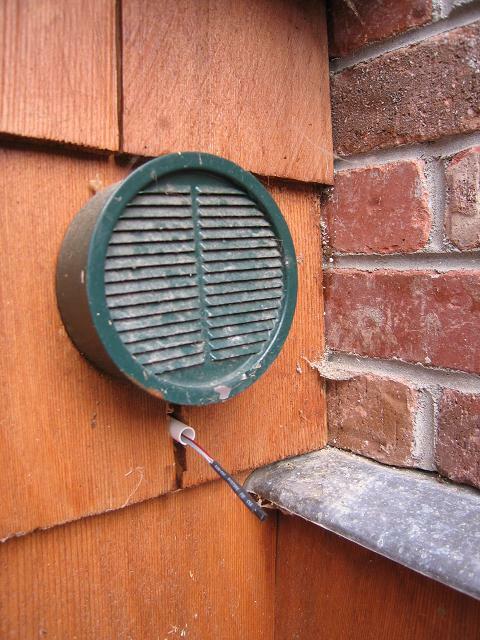 My sensor is mounted on the south-facing wall of the house; when it's cloudy or dark, the sensor measures the air temp accurately. But when the sun comes out, it shines directly on the sensor and the measured temperature jumps dramatically. That's about all there is to the hardware and firmware part of the project. It took a while to get it all working correctly, but now it just hums along, continuously sending data to the webserver. I'm somewhat obsessed with monitoring the system - I found that I'd lie in bed at night wondering if the boiler was functioning or if the fire had gone out. The fire actually does die once in a while, particularly when it's warm out and the house doesn't draw much heat, and it's a bummer to be surprised by a lukewarm shower on a cold winter's morning. 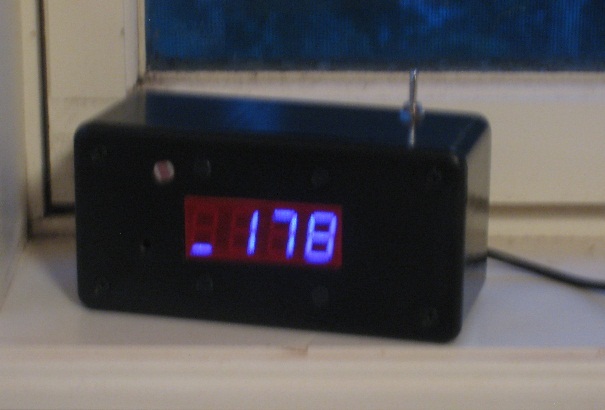 Of course it's just not any old box this uses WiFi to fetch the current OWB temperature every 30 seconds! The small box sits on the windowsill, where I can easily see it lying in bed. 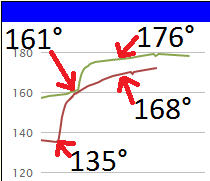 Here the temp is 178° - normal operating range seems to be between 156° and 182° (see the green line here). The underline at the left shows that the temp has fallen since the last reading (the top bar is lit when the temp is rising). Finally, the circle to the top-left of the display is a light sensor: the display is bright when the room is bright and dim when it's dark. 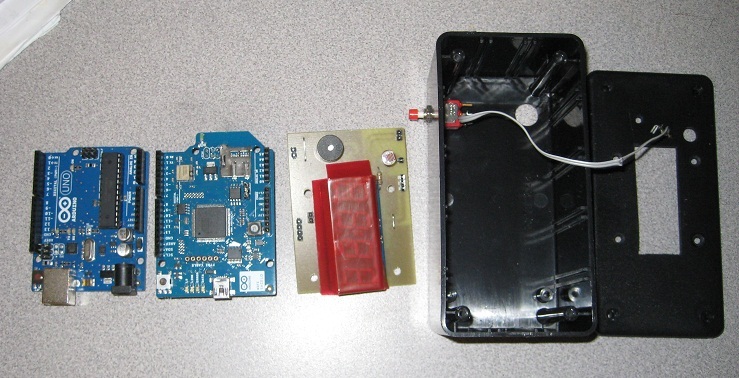 From left to right: Arduino Uno, Arduino WiFi shield, my custom shield for the display, and the box. 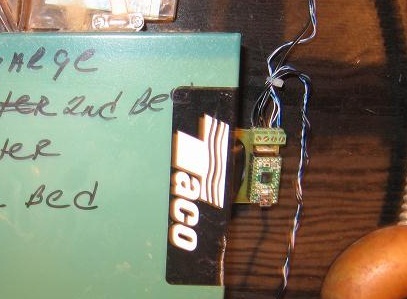 This was an early design: the pushbutton has been replaced by a switch. My solution was to put a few layers of automovie lens repair tape over the display... the stuff is pretty thick and semi-opaque. Thru several nights' of experimentation I found that 3 layers of tape was the right amount. So now I sleep soundly at night, able to check how things are working with a quick glance whenever I roll over. The OWB occasionally dies, either due to the fire going out or because I didn't load enough wood. When this happens, the OWB temperature drops, causing the house to demand more heat, which causes the OWB temperature to drop even faster. If the OWB temperature drops below 150° the house can't maintain it's temperature: all the zones turn on! When this happens, I turn on the oil burner to bring the system back up to temperature, then relight the OWB, then wait a few hours for the OWB to get back up to 190°, then I can turn the oil burner off. I can't turn the oil off until the OWB gets up to temperature because the house would steal all the OWB heat and it takes FOREVER to get the OWB back up to full temperature. I was originally doing this by disconnecting the oil controller's AC power. But it's not a good thing to do when the furnace is running. 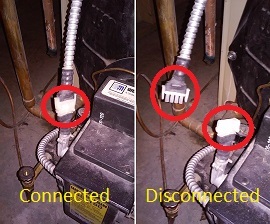 You need to wait for the furnace to shut itself off before disconnecting it. 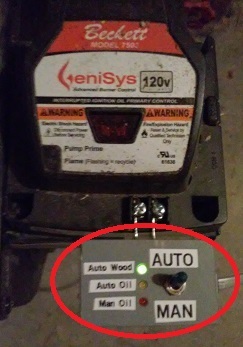 It sure would be nice if the system could automatically switch between oil and wood based upon the OWB temperature; that would allow me to not have to scramble in the middle of the night when the fire goes out, and even go away for a few days without needing to do anything to the system. It comes from the factory with a jumper wire: the oil is permanently on. 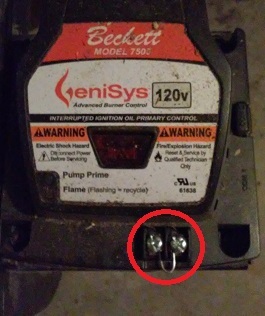 I found that it's safe to disconnect this when the burner is running, as the oil controller will gracefully shut down. When the OWB rises above 185° it automatically shuts the oil burner off (green LED). Putting the switch in "MAN" position forces the oil burner on (red LED), useful for when the furnace serviceman is here. And if the HHM power fails, the relay automatically closes, setting the furnace to oil. And of course it has LEDs to tell you what it's thinking. When the boiler is low on wood (1st thing in the AM) and it's really cold out (2° at the time), the OWB takes a while to get back up to temperature (the load of wood is 2°, plus it takes energy to start it burning). So the system detected the low OWB temp and switched to oil for about 2 hours in order to help the OWB heat back up. Without the oil, it would take at least 6 hours to get back up to temperature.